We have previously reported that paclitaxel (Taxol) is a potent inducer of cytochrome P-450 (CYP) 3A protein and CYP3A mRNA in human hepatocyte cultures. Here we report that Taxol increased CYP3A-dependent testosterone 6β-hydroxylation in intact hepatocytes. This effect was concentration-dependent, with maximal increase in enzyme activity being observed at 10 μM Taxol. Treatment of hepatocyte cultures with concentrations of Taxol higher than 10 μM caused a dose-dependent decrease in testosterone 6β-hydroxylase activity, amount of CYP3A protein, and total protein synthesis. The maximal CYP3A activity detected after treatment with Taxol or rifampicin was similar in six separate human hepatocyte cultures, suggesting that the cultures have achieved a limit of maximally inducible CYP3A. The fold increase in enzyme activity, however, was different and was inversely related to the level of expression in untreated hepatocytes, with the greatest increases being observed in the hepatocytes that expressed the lowest basal level of CYP3A. Pretreatment of hepatocytes with triacetyloleandomycin resulted in a 90% inhibition of testosterone 6β-hydroxylase activity. Our results demonstrate the use of human hepatocyte cultures to investigate the induction of cytochrome P-450 by xenobiotics in intact cells and stress the importance of large dose-response studies as well as the need to assess toxicity in these investigations. The response to inducers of CYP3A activity were very consistent among different hepatocyte donors. Absolute values of testosterone 6β-hydroxylase activity did not vary more than 2- and 5-fold in induced and untreated hepatocytes, respectively. Primary cultures of human hepatocytes represent a unique in vitro system to study the potential of drugs to induce phase I and phase II enzymes involved in drug metabolism. We and others have successfully used human hepatocyte cultures to investigate the effect of various drugs on cytochrome P-450 (CYP)1 induction and drug metabolism (Kostrubsky et al., 1995, 1998; reviewed in Maurel, 1996 and Li, 1997; Chang et al., 1997; Silva et al., 1998). A number of drugs have been reported to cause an increase in the metabolism of other coadministered drugs and to induce their own metabolism (autoinducers). Rifampicin is known to induce the metabolism of numerous drugs, including warfarin, digitoxin, ethynylestradiol, glucocorticoids, vitamin D, and thyroxine (reviewed in Venkatesan, 1992). In addition, rifampicin and its analog rifabutin increase their own metabolism after repeated administration to patients (reviewed inBenedetti and Dostert, 1994). Rifampicin also causes an increase in the urinary ratio of 6β-hydroxycortisol to 17-hydroxycorticosterone, indicating the induction of CYP3A4 in vivo (Ohnhaus and Park, 1979; Ged et al., 1989). Primary cultures of human hepatocytes are responsive to induction of CYPs and can be used to assess interactions resulting from the induction of CYPs during multiple drug therapy. Rifampicin is a potent inducer of CYP3A in primary cultures of human hepatocytes (Pichard et al., 1992;Schuetz et al., 1993; Kostrubsky et al., 1995, 1998) and is widely used as a prototypical inducer of CYP3A in this system. Additional drugs known to induce CYPs and to cause autoinduction in patients include cyclophosphamide and ifosfamide (Kurowski and Wagner, 1993). In cultured human hepatocytes they have been shown to be inducers of CYP3A and CYP2C (Chang et al., 1997). Thus, cultured hepatocytes can be used to predict in vivo effects. Because drugs that induce CYP may affect the metabolism of coadministered drugs as well as their own metabolism, it is prudent to determine whether the drug under development has the capacity to induce specific forms of CYP. Here we present a strategy applied in our laboratory to determine the potential of an agent to induce CYP in human hepatocytes. This approach does not require any prior knowledge of the metabolism or disposition of the test compound, but instead uses the ability of a drug to induce the metabolism of isoform-specific substrate, such as the conversion of testosterone to 6β-hydroxytestosterone by CYP3A. This method utilizes intact human hepatocytes for metabolic activities, not microsomal suspensions, and can provide quick and reproducible estimates of CYP3A metabolic capacity and protein levels. To test the effectiveness of the system, we examined a currently used therapeutic agent, Taxol (paclitaxel), which has been shown in earlier studies to be an effective inducer of CYP3A4 protein and CYP3A4 mRNA (Kostrubsky et al., 1998). In seven cultures of human hepatocytes, we investigated whether Taxol induces CYP3A enzyme activity, and compared the response to that mediated by rifampicin. The results indicate that if Taxol had been a new drug entity, the screening system presented here with human hepatocytes would have identified it as a potent inducer of CYP3A. Williams E culture medium (HMM) and medium supplements, dexamethasone and insulin, were obtained from BioWhittaker (Walkersville, MD). Penicillin G/streptomycin was obtained from Gibco Laboratories (Grand Island, NY). Paclitaxel (from Taxus yannanensis, minimum 97% pure), rifampicin, phenobarbital, triacetyloleandomycin (TAO), and testosterone were obtained from Sigma (St. Louis, MO). 6β-Hydroxytestosterone was obtained from Steraloids (Wilton, NH). Falcon culture dishes (60 mm) were obtained from Becton Labware (Franklin Lakes, NJ). Nitroblue tetrazolium/5-bromo-4-chloro-3-indolyl phosphate (NBT/BCIP) color developing reagent and alkaline phosphatase-conjugated anti-rabbit and anti-goat antibodies were purchased from Bio-Rad (Richmond, CA). Baculovirus-expressed CYP3A4 was obtained from Gentest (Woburn, MA). Hepatocyte Cultures and Treatment Protocol. Hepatocytes were isolated from human livers not used for whole organ transplant (HH1, nonheart-beating donor; HH3, fibrosis of liver artery) or from tissues remaining after reduced liver allografts (HH2, 4, 5, 6, and 7). Significant levels of steatosis (fat) were not observed in any of the seven livers. Hepatocytes were isolated by three-step collagenase perfusion as described previously (Strom et al., 1996). Viability at plating was greater than 84% and Percoll-gradient centrifugation was not required. Hepatocytes were plated in Williams medium E supplemented with 10−7 M dexamethasone, 10−7 M insulin, 100 U/ml penicillin G, 100 μg/ml streptomycin, and 10% bovine calf serum. Hepatocytes (3 × 106) were plated on 60-mm culture plates previously coated with type I (rat-tail) collagen. Cells were allowed to attach for 4 h at 37°C, at which time the media were replaced with serum-free media with the supplements listed above and changed every 24 h thereafter. Cells were treated with Taxol (0.2–30 μM), rifampicin (10 μM), or phenobarbital (2 mM) from 48 to 96 h in culture. At 72 h in culture, the media were changed and inducers were readded. Where indicated, cells received 25 μM TAO dissolved in sterile water, as described previously (Kostrubsky et al., 1997), 1 h before the addition of testosterone and again at the time of addition of testosterone. Concentrated stocks of Taxol or rifampicin were prepared in dimethyl sulfoxide. The final concentration of dimethyl sulfoxide in culture media was 0.1%. This concentration of dimethyl sulfoxide does not inhibit the metabolism of testosterone to 6β-hydroxytestosterone by intact human hepatocytes (result not shown). 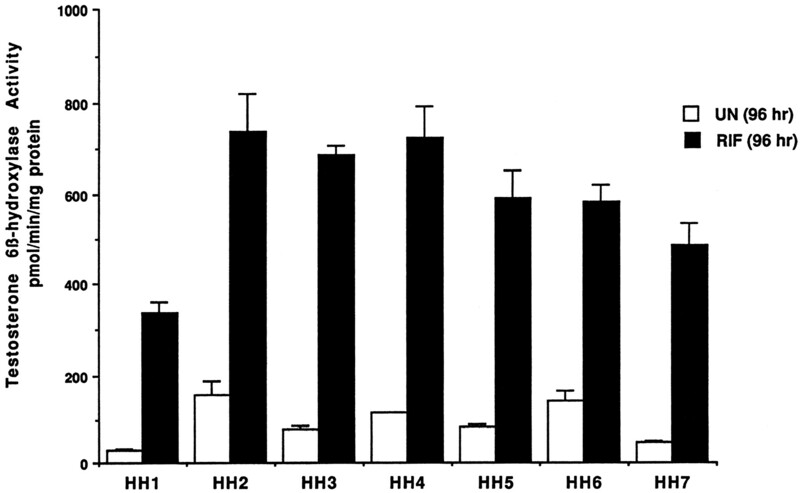 Testosterone 6β-hydroxylase activity was measured in intact cultured hepatocytes. After a 48-h exposure to the inducers, the culture media were replaced with fresh Williams medium E. One hour later, the media were replaced with Williams medium E (3 ml/plate) containing 100 μM testosterone. Aliquots of the media (250 μl) were removed after 30 min of incubation at 37°C. The formation of 6β-hydroxytestosterone was measured by HPLC, as described previously (Waxman et al., 1983; Crespi and Penman, 1997), with the following modifications: culture medium (100 μl) was diluted with methanol (1:1, v/v) and injected into a LiChrospher 100 RP-18 column (4.6 × 250 mm, 5 μm) with a mobile phase of methanol/water (60:40) at a flow rate of 1.2 ml/min. The eluent was detected by its absorbance at 242 nm and quantified by comparing the absorbance to a standard curve of 6β-hydroxytestosterone prepared in Williams medium E. A 2-h incubation of sample with β-glucuronidase and sulfatase at 37°C did not increase the amount of 6β-hydroxytestosterone formed (results not shown). Immunochemical analysis of CYP3A was conducted as described previously (Kostrubsky et al., 1995) with total cell sonicates. CYP3A4/5 were detected with a rabbit anti-human CYP3A antibody that detects both CYP3A4 and CYP3A5 proteins (Wrighton et al., 1990; Kostrubsky et al., 1995, 1998). Alkaline phosphatase-conjugated anti-rabbit or anti-goat antibodies and nitroblue tetrazolium/5-bromo-4-chloro-3-indolyl phosphate (NBT/BCIP) developing reagents were used to visualize blots. Toxicity was determined by the measurement of total protein synthesis by pulse-labeling hepatocytes for 1 h with [14C]leucine, as described previously (Kostrubsky et al., 1997). Proteins were determined by the procedure of Lowry et al. (1951). The immunoblots were quantitated with an Alpha Imager 2000 Densitometer (IMGEN Technologies, Alexandria, VA). Results were analyzed by a two-factor ANOVA. A p < .05 was interpreted as the level of statistical significance. To test the reverse relationship between the testosterone 6β-hydroxylase activity in untreated hepatocytes and the fold-increase in induced hepatocytes, regression analysis with InStat 2.01 was performed. Induction of Testosterone 6β-Hydroxylase Activity by Taxol: Comparison to Rifampicin. Information on the donor livers is presented in Table1. We first determined the toxicity of Taxol in primary cultures of human hepatocytes. Hepatocytes from HH1 were treated with Taxol at concentrations of 0.2, 1, 4, 10, 15, 20, and 30 μM for 48 h, and total protein synthesis was measured as described previously (Kostrubsky et al., 1997). 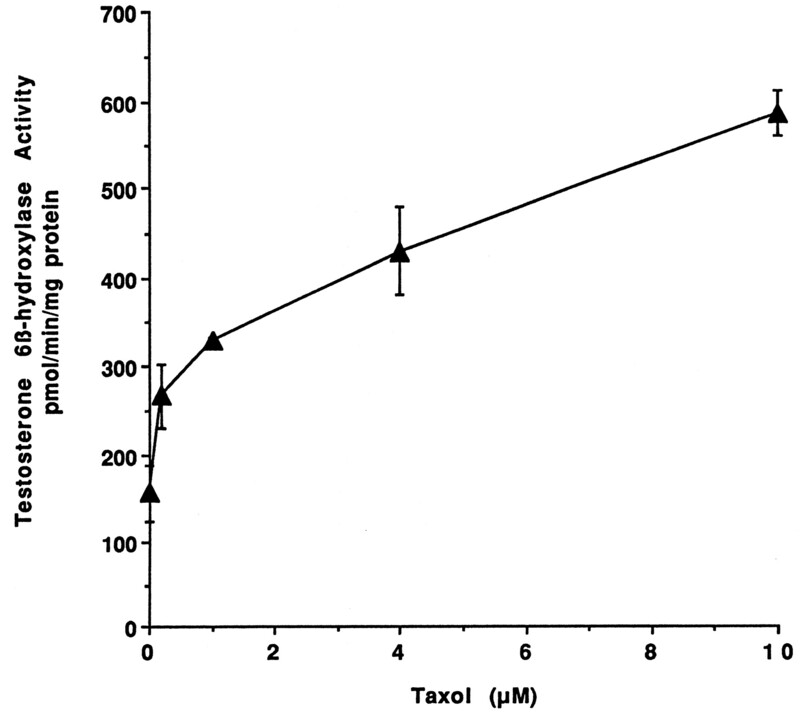 Data presented in Fig.1 show that concentrations of Taxol up to 10 μM did not decrease total protein synthesis. However, treatment of hepatocytes with 30 μM Taxol resulted in a 26% inhibition of total protein synthesis (p < .01; Fig. 1). 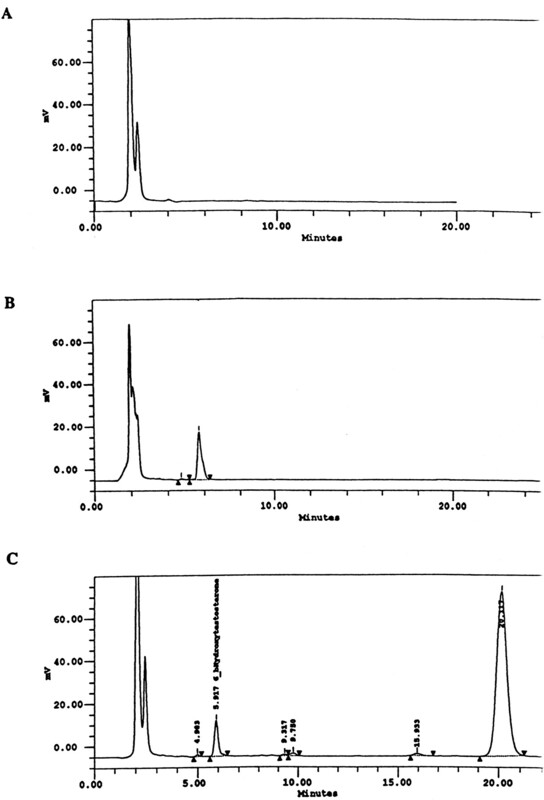 Next we investigated the effect of Taxol on testosterone 6β-hydroxylase activity, catalyzed by CYP3A (Waxman et al., 1991, 1988), by measuring the formation of 6β-hydroxytestosterone in the medium as shown in the chromatograms in Fig.2. An increase of testosterone 6β-hydroxylase activity of 2-, 4.6-, 6.8-, and 7.7-fold were detected in hepatocytes pretreated with 0.2, 1, 4, and 10 μM Taxol, respectively. However, concentrations of Taxol above 10 μM caused a dose-dependent decrease in the inducible level of testosterone 6β-hydroxylase, with the activity reaching almost the basal level at 30 μM Taxol (Fig. 3). These results were confirmed by the analysis of immunoreactive CYP3A protein in hepatocytes. A maximum 3.2-fold increase in CYP3A was found at 10 μM Taxol (Fig. 4) with a concentration-dependent decrease being observed at the higher concentrations. There was a significant correlation (r2 = 0.9) between CYP3A protein and testosterone 6β-hydroxylase activity. Rifampicin, a potent inducer of CYP3A (Daujat et al., 1991; Schuetz et al., 1993; Kostrubsky et al., 1998), was used as a positive control. Treatment of HH1 with 10 μM rifampicin resulted in a 10-fold increase in testosterone 6β-hydroxylase activity (Figs. 5 and 8) and a 3.4-fold increase in CYP3A protein (Fig. 4). To confirm that CYP3A was responsible for the increases in testosterone metabolism in Taxol-treated cells, we investigated whether TAO, a selective inhibitor of CYP3A (Chang et al., 1994; Newton et al., 1995), would prevent the metabolism of testosterone to 6β-hydroxytestosterone. Hepatocytes from HH1 were pretreated with 10 μM Taxol, 10 μM rifampicin, or 2 mM phenobarbital for 48 h. Addition of TAO (25 μM), 1 h before and concomitant with the addition of testosterone, resulted in approximately 90% inhibition in testosterone 6β-hydroxylase activities in Taxol-, rifampicin-, or phenobarbital-treated hepatocytes (Fig. 5). The activity of testosterone 6β-hydroxylase in untreated hepatocytes exposed to TAO was below the limit of detection of the analysis of 6β-testosterone. Because the response of different cultures of human hepatocytes to the same treatments may vary depending on the donor, we investigated the effect of treatments with Taxol on testosterone 6β-hydroxylase activity in hepatocytes prepared from a separate donor HH2. Figure 6 shows that treatment of hepatocytes with 0.2, 1, 4, or 10 μM Taxol resulted in a 1.7-, 2.1-, 2.7-, and 3.7-fold increase in testosterone 6β-hydroxylase activity, respectively. Treatment of HH2 with rifampicin at 10 μM caused a 4.7-fold increase in testosterone 6β-hydroxylase activity (Fig. 8). Because the fold-increases in CYP3A activity between HH1 and HH2 were so dramatically different, we investigated whether this difference can be explained by the differences in the basal level of testosterone 6β-hydroxylase activity observed in hepatocytes from different donors. We also measured the activity of testosterone 6β-hydroxylase in hepatocytes cultured for only 24 h after plating to compare these activities with untreated hepatocytes cultured for 96 h. The result of testosterone 6β-hydroxylase activities in seven cultures of human hepatocytes is shown in Fig. 7. Untreated hepatocytes from HH2, 3, 4, and 6 after 24 h in culture demonstrated high activities, with an average rate of 350 ± 48 pmol/min/mg protein as compared with the low average activity of 71 ± 19 pmol/min/mg protein for hepatocytes prepared from HH1, 5, and 7 (Fig. 7). After 96 h in culture, untreated hepatocytes from the seven donors metabolized testosterone to the 6β-derivative with an average rate of 93 ± 47 pmol/min/mg protein, indicating that the fresh hepatocytes, which expressed the high activities by 24 h, also experienced the greatest loss by 96 h in culture. Pretreatment with 4 μM Taxol resulted in 3- to 7-fold increases in testosterone 6β-hydroxylase activities in hepatocytes from all cultures, as compared with the untreated cells. Pretreatment of hepatocytes from HH1 to 7 with 10 μM rifampicin also resulted in 4- to 7-fold increases in testosterone metabolism (Fig.8). There was a clear correlation (r2 = 0.84) between the increase in CYP3A activities caused by Taxol and rifampicin in separate cultures. We investigated the relationship between the induction of CYP3A by Taxol or rifampicin and basal activities of testosterone 6β-hydroxylase in untreated hepatocytes after 96 h in culture. As shown in Fig. 9, using regression analysis on data from seven cultures of human hepatocytes, increases in CYP3A activities were inversely proportional to their levels of expression in untreated hepatocytes, with the greatest fold-increase over control being observed in hepatocytes expressing the lowest basal level of CYP3A. Effect of Taxol on hepatocyte toxicity. Hepatocytes prepared from donor HH1 were treated for 48 h with 0.2, 1.0, 4.0, 10, 15, 20, and 30 μM Taxol. At the end of this time, the medium was changed and protein synthesis was determined by a pulse labeling with [14C]leucine for 1 h as described inMaterials and Methods. Each value, expressed as a percentage of the value in untreated cells, represents the mean of triplicate treatments, with the S.D. indicated by the vertical bars. The absolute value in untreated cells was 5756 ± 265 dpm/mg protein. *Significantly different from untreated cells with p < .01. Analysis of 6β-hydroxytestosterone in culture medium. A, culture medium alone. B, culture medium with a standard of 6β-hydroxytestosterone. C, culture medium from hepatocytes treated with Taxol and incubated with testosterone. Retention times for 6β-hydroxytestosterone and testosterone are 5.9 and 20.1 min, respectively. Effect of Taxol on testosterone 6β-hydroxylase activity. Hepatocytes prepared from donor HH1 were treated for 48 h with 0.2, 1.0, 4.0, 10, 15, 20, and 30 μM Taxol. At the end of this time, the medium was changed and testosterone at 100 μM was added to the cells. After 30 min of incubation, aliquots of the medium were removed, and testosterone 6β-hydroxylase activity was determined as described in Materials and Methods. Each value represents the mean of triplicate treatments with the S.D. indicated by the vertical bars. Effect of Taxol on CYP3A protein. Hepatocytes prepared from donor HH1 were treated for 48 h with 1.0, 4.0, 10, 15, 20, and 30 μM Taxol, 10 μM rifampicin, or 2 mM phenobarbital. CYP3A was analyzed in sonicates of whole cells as described in Materials and Methods. Twelve micrograms of sonicate protein was applied per well. UN, untreated; RIF, rifampicin; PB, phenobarbital. Effect of TAO on testosterone 6β-hydroxylase activity. Hepatocytes were treated for 48 h with 4 μM Taxol, 10 μM rifampicin, or 2 mM phenobarbital. At the end of this time, the medium was changed and testosterone at 100 μM was added to the cells. Some cells received 25 μM TAO 1 h before the addition of testosterone and again at the time of addition of testosterone. After 30 min of incubation, aliquots of the medium were removed and testosterone 6β-hydroxylase activity was determined as described inMaterials and Methods. UN, untreated; TAX, Taxol; RIF, rifampicin; PB, phenobarbital. Each value represents the mean of triplicate treatments with the S.D. indicated by the vertical bars. Effect of rifampicin on testosterone 6β-hydroxylase activity in cultures of hepatocytes prepared from seven different donors. Hepatocytes prepared from donors indicated in the figure were either left untreated for 24 or 96 h after plating or treated for 48 h with 10 μM rifampicin. At the end of this time, the medium was changed, and testosterone at 100 μM was added to the cells. After 30 min of incubation, aliquots of the medium were removed and testosterone 6β-hydroxylase activity was determined as described inMaterials and Methods. UN (96 h), untreated hepatocytes cultured for 96 h; RIF (96 h), rifampicin (10 μM)-treated hepatocytes. Each value represents the mean of triplicate treatments with the S.D. indicated by the vertical bars. Hepatocytes prepared from donor HH2 were treated for 48 h with 0.2, 1.0, 4.0, and 10 μM Taxol. At the end of this time, the medium was changed and testosterone at 100 μM was added to the cells. After 30 min of incubation, aliquots of the medium were removed, and testosterone 6β-hydroxylase activity was determined as described inMaterials and Methods. Each value represents the mean of triplicate treatments with the S.D. indicated by the vertical bars. Effect of Taxol on testosterone 6β-hydroxylase activity in cultures of hepatocytes prepared from seven different donors. Hepatocytes prepared from donors indicated in the figure were either left untreated for 24 or 96 h after plating or treated for 48 h with 4 μM Taxol. At the end of this time, the medium was changed and testosterone at 100 μM was added to the cells. After 30 min of incubation, aliquots of the medium were removed, and testosterone 6β-hydroxylase activity was determined as described inMaterials and Methods. UN (24 h), untreated hepatocytes cultured for 24 h; UN (96 h), untreated hepatocytes cultured for 96 h; TAX (96 h), Taxol (4 μM)-induced hepatocytes. Each value represents the mean of triplicate treatments with the S.D. indicated by the vertical bars. Relationship between testosterone 6β-hydroxylase activity in untreated hepatocytes and fold-increase in testosterone 6β-hydroxylase activity caused by 4 μM Taxol or 10 μM rifampicin. Hepatocytes prepared from seven different donors were either left untreated or treated for 48 h with 4 μM Taxol or 10 μM rifampicin. At the end of this time, the medium was changed, and testosterone at 100 μM was added to the cells. After 30 min of incubation, aliquots of the medium were removed and testosterone 6β-hydroxylase activity was determined as described inMaterials and Methods. Results represent the fold-increase in testosterone 6β-hydroxylase activity in Taxol- or rifampicin-treated cells over testosterone 6β-hydroxylase activity in untreated cells for each donor after 96 h in culture. RIF, rifampicin. In this study, we found that induction of CYP3A by Taxol, rifampicin, or phenobarbital is associated with increased 6β-hydroxylation of testosterone by intact cells. We demonstrated that Taxol is a potent inducer of CYP3A-mediated testosterone 6β-hydroxylase activity, confirming our previous reports that Taxol is a potent inducer of CYP3A protein and CYP3A4 mRNA in rat and human hepatocyte cultures (Kostrubsky et al., 1997, 1998). When induction of drug-metabolizing enzymes is studied, one is interested in whether a potential inducer will increase the metabolism of coadministered drugs and whether it increases its own metabolism. One of the best examples of a drug that is known to cause induction is rifampicin (Venkatesan, 1992). Rifampicin also is a potent inducer of CYP3A in primary cultures of human hepatocytes, with the maximum induction caused by 10 μM after a 48-h treatment (Li, 1997), and, therefore, can be used as a positive control treatment to study the induction of CYP3A. Because CYP3A4 mediates the metabolism of Taxol to C3′-paclitaxel as well as the hydroxylation of 6α-hydroxypaclitaxel to dihydropaclitaxel (Cresteil et al., 1994; Harris et al., 1994), induction of this enzyme activity may increase the metabolism of Taxol, therefore resulting in a decrease in its therapeutic efficacy. Alternatively, Taxol can increase the metabolism of coadministered drugs. The increases in CYP3A activity and protein level by Taxol were similar to those caused by rifampicin. Because the concentrations of Taxol used in culture are within the therapeutic range (Sonnichsen et al., 1995; Monsarrat et al., 1998), it is likely that Taxol will induce CYP3A in vivo, resulting in increased metabolism of other drugs that are substrates for CYP3A. Conversely, patients treated with Taxol receive a complex therapy including dexamethasone or methylprednisolone to prevent hypersensitivity reactions (Uziely et al., 1994; Monsarrat et al., 1998). These latter drugs may also increase the levels of CYP3A (Pichard et al., 1990;Cresteil et al., 1994). If so, Taxol may cause no additional increase in CYP3A. This possibility is supported by our data indicating that testosterone 6β-hydroxylase activities detected at a high level in HH2, 3, 4, and 6 after 24 h in culture were only moderately exceeded by treatments with Taxol or rifampicin (Figs. 7 and 8), suggesting that CYP3A has been maximally expressed in these people. Indeed, it has been proposed that treatment with methylprednisolone or phenobarbital induces the metabolism of Taxol as demonstrated in a patient and in human liver microsomes (Cresteil et al., 1994; Monsarrat et al., 1998). In the present study, hepatocytes from four of the seven donors demonstrated high CYP3A activity at 24 h after isolation with an average rate of 350 ± 48 pmol/min/mg protein. Donors HH2 and HH6 were exposed to phenobarbital and dexamethasone (Table 1), respectively, drugs which are known to induce CYP3A. Although donors HH4 and HH7 were both exposed to methylprednisolone, only HH4 had a high basal level of CYP3A at 24 h (Table 1). In liver preparations in which the CYP3A levels were high at 24 h, these levels decreased by 96 h. Furthermore, CYP3A activity was increased to the levels detected after 24 h by treatment with Taxol or rifampicin. Cultured hepatocytes, which demonstrated a low level of CYP3A activity after 24 h, did not experience much more of a decrease by 96 h but were still strongly induced by Taxol or rifampicin, indicating that a low basal activity of CYP3A in hepatocytes cannot be used as an indication of viability of hepatocytes or their suitability for metabolic studies. 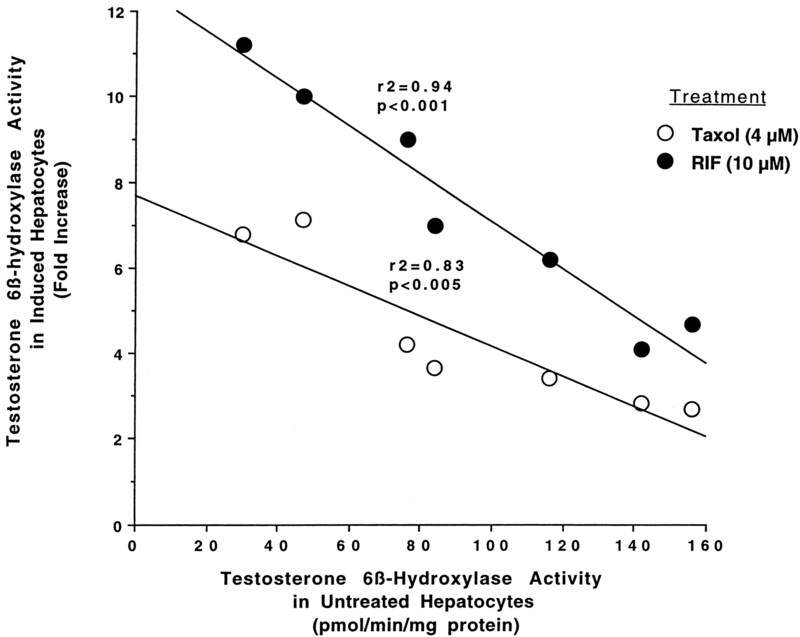 Comparison of rates of testosterone 6β-hydroxylase activities between different donors in response to either Taxol or rifampicin revealed that the increases were similar (r2 = 0.84). Taxol at 4 μM and rifampicin at 10 μM increased activities to 343 ± 76 and 591 ± 143 pmol/min/mg protein, respectively, with no more then a 2-fold variation between cultures (Figs. 7 and 8). In contrast, the variation in basal level of CYP3A expression after 96 h in culture was up to 5-fold between different donors (Fig. 8). We have previously proposed that the variation between different donors in the fold-increase of CYP3A is due to the differences in the basal level of CYP3A in untreated cells (Kostrubsky et al., 1998). As shown in Figs. 7to 9, the differences in fold-increases between separate cultures can in part be explained by different basal levels of CYP3A after 96 h in culture. In contrast, the maximally induced values were similar in six cultures, probably representing the maximal extent to which CYP3A can be induced with this protocol. This observation is also supported by Chang et al. 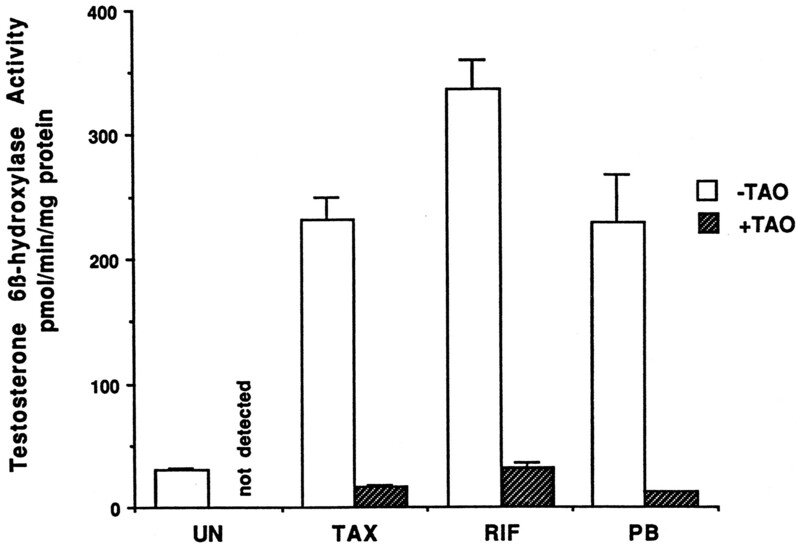 (1997), who reported that induction of oxazaphosphorine 4-hydroxylation activity by rifampicin in human hepatocyte cultures was inversely related to the basal activity. In addition, Silva et al. (1998) found that variations in the levels of CYP3A protein in cultured hepatocytes from four donors treated with two different CYP3A inducers did not exceed 34%, if induction is expressed as a percentage of that caused by rifampicin. In contrast, they observed 2- to 8-fold variation, if induction was expressed relative to untreated cells (Silva et al., 1998). These results are similar to our findings, and suggest that CYP3A protein was induced to a similar level in separate cultures and that the large variation is determined by the level of CYP3A expression in untreated cells. It was reported that the expression of CYP2B1 and CYP2B2 genes in rat hepatocytes follows a bell-shaped curve such that, after an induction at lower concentrations of phenobarbital, CYP2B1 and CYP2B2 expression was reduced after treatment with phenobarbital at concentrations higher than 0.5 mM. However, CYP3A1 was fully responsive even at high concentrations of phenobarbital (Sidhu and Omiecinski, 1995). In our study with human hepatocytes, Taxol at 30 μM decreased CYP3A activity, CYP3A protein, and total protein synthesis, indicating nonspecific cell toxicity. Because decreases in enzyme activities at 15 and 20 μM Taxol were greater than the decreases in CYP3A protein, it may indicate, at least in part, inhibition of testosterone 6β-hydroxylase activity by Taxol at these concentrations. In summary, we have demonstrated that CYP3A in human hepatocytes induced by Taxol, rifampicin, or phenobarbital is enzymatically active in intact cells. The level of enzyme activity maximally induced by Taxol or rifampicin was similar in six different cultures. In dose-response studies, higher concentrations of Taxol resulted in decreases in CYP3A activity and immunoreactive protein. Our results suggest that the investigation of the potential of drugs to induce CYP in human hepatocyte cultures should include a large dose-response measurement of cell toxicity as well as CYP-associated enzyme activities. We thank Oingshow Huang for her help with statistical analysis. This work was supported in part by the Anatomic Gift Foundation (K.D., J.E.E., S.C.S. ), National Institutes of Health Grant NIH-N01-DK-9-2310 to SCS, and a postdoctoral fellowship from Lilly Research Laboratories (V.E.K.). (1994) Induction and autoinduction properties of rifampicin derivatives: A review of animal and human studies. Environ Health Perspect 102:101–105. (1994) Evaluation of triacetyloleandomycin, α-naphthoflavone and diethyldithiocarbamate as selective chemical probes for inhibition of human cytochromes P450. Arch Biochem Biophys 311:437–442. (1997) Use of cDNA-expressed human cytochrome P450 enzymes to study potential drug-drug interaction. Adv Pharmacol 43:171–188. (1991) Induction protocols for cytochrome P450 IIIA in vivo and in primary cultures of animal and human hepatocytes. Methods Enzymol 206:345–353. (1989) The increase in urinary excretion of 6β-hydroxycortisol as a marker of human hepatic cytochrome P450IIIA induction. Br J Clin Pharmacol 28:373–387. (1994) Metabolism of Taxol by human hepatic microsomes and liver slices: Participation of cytochrome P450 3A and an unknown P450 enzyme. Cancer Res 54:4026–4035. 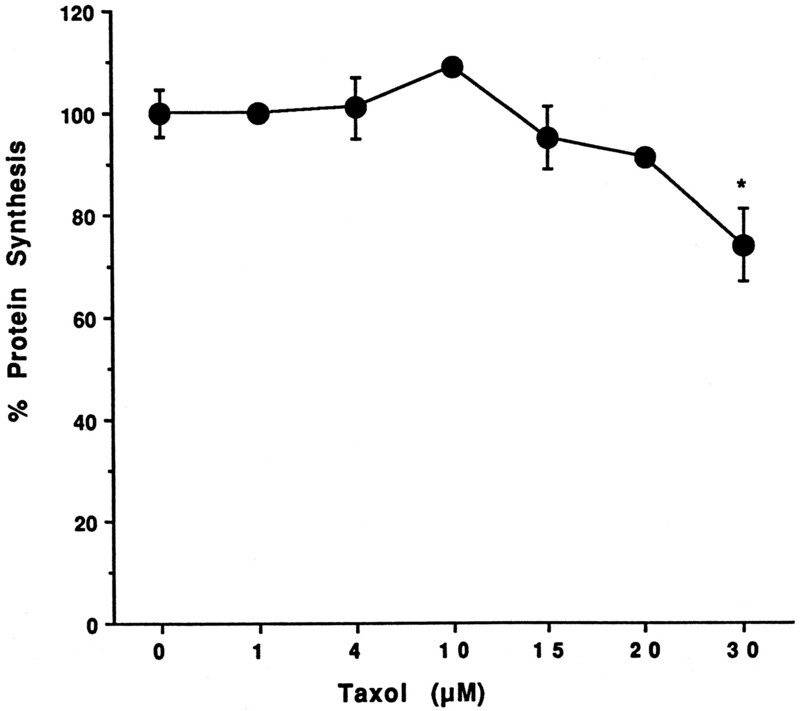 (1998) Induction of CYP3A by Taxol in primary cultures of human hepatocytes. Arch Biochem Biophys 355:131–136. 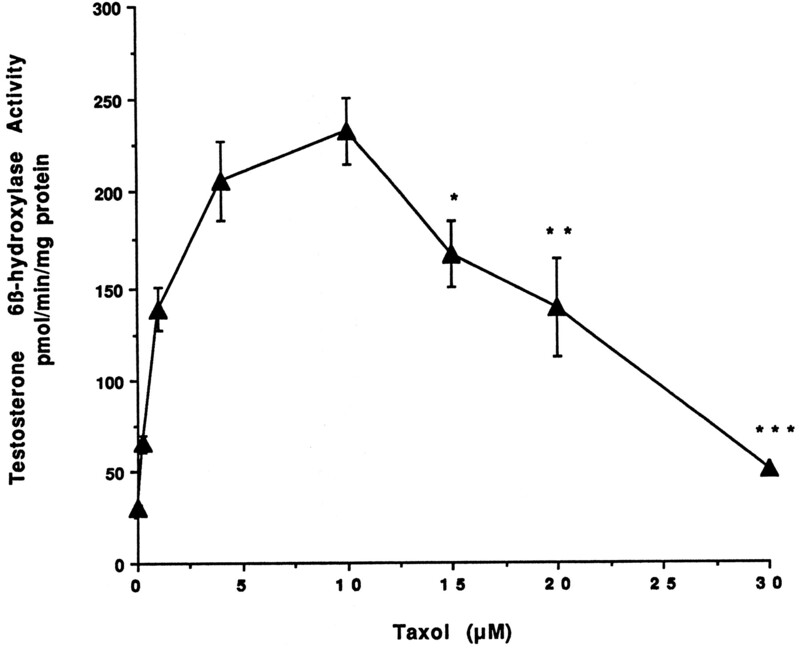 (1997) Effect of Taxol on cytochrome P450 3A and acetaminophen toxicity in cultured rat hepatocytes: Comparison to dexamethasone. Toxicol Appl Pharmacol 142:79–86. 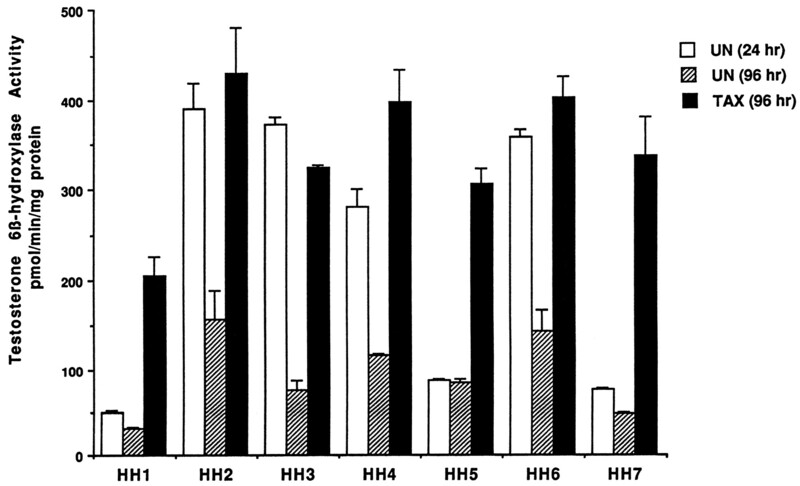 (1995) Ethanol and isopentanol increase CYP3A and CYP2E in primary cultures of human hepatocytes. Arch Biochem Biophys 322:516–520. (1993) Comparative pharmacokinetics of ifosfamide, 4-hydroxyifosfamide, chloroacetaldehyde and 2- and 3-dechloroethyliifosfamide in patients on fractionated intravenous ifosfamide therapy. Cancer Chemother Pharmacol 33:36–42. (1997) Primary hepatocyte cultures as an in vitro experimental model for the evaluation of pharmacokinetic drug-drug interactions. Adv Pharmacol 43:103–130. (1998) Modification of paclitaxel metabolism in a cancer patient by induction of cytochrome P450 3A4. Drug Metab Dispos 26:229–233. (1995) Cytochrome P450 inhibitors: Evaluation of specificities in the in vitro metabolism of therapeutic agents by human liver microsomes. Drug Metab Dispos 23:154–158. (1979) Measurements of urinary 6-β-hydroxycortisol excretion as in vivo parameter in the clinical assessment of the microsomal enzyme-inducing capacity of antipyrine, phenobarbitone and rifampicin. Eur J Clin Pharmacol 15:139–145. (1990) Cyclosporin A drug interactions. Drug Metab Dispos 18:595–606. (1995) Modulation of xenobiotic-inducible cytochrome P450 gene expression by dexamethasone in primary rat hepatocytes. Pharmacogenetics 5:24–36. (1998) Refinement of an in vitro cell model for cytochrome P450 induction. Drug Metab Dispos 26:490–496. (1994) Low doses of dexamethasone protect against Paclitaxel (Taxol)-related hypersensitivity reactions following cycle 1. Ann Oncol 5:474. (1992) Pharmacokinetic drug interactions with rifampicin. Clin Pharmacokinet 22:47–65. (1988) Human liver microsomal steroid metabolism: Identification of the major microsomal steroid hormone 6β-hydroxylase cytochrome P-450 enzyme. Arch Biochem Biophys 263:424–436. (1983) Regioselectivity and stereoselectivity of androgen hydroxylations catalyzed by cytochrome P-450 isozymes purified from phenobarbital-induced rat liver. J Biol Chem 258:11937–11947. (1991) Steroid hormone hydroxylase specificities of eleven cDNA-expressed human cytochrome P450 enzymes. Arch Biochem Biophys 290:160–166.